Among the roster announcements Tuesday were that Vladimir Tarasenko (left) will represent Russia and Patrik Berglund will play for Sweden in the Olympic Games in Sochi next month. ST. LOUIS — With 10 players competing for six different countries, the St. Louis Blues will be well represented at the 2014 Winter Olympics in Russia. David Backes, T.J. Oshie and Kevin Shattenkirk were announced as members of the U.S. roster last week, and over the last two days, seven more Blues were tabbed to represent their countries in Sochi: Alex Pietrangelo and Jay Bouwmeester (Canada), Alexander Steen and Patrik Berglund (Sweden), Vladimir Tarasenko (Russia), Jaroslav Halak (Slovakia) and Vladimir Sobotka (Czech Republic). "I think you’re really proud any time any player you’re coaching gets to represent the country," Blues coach Ken Hitchcock said last week. "You’re proud first for them and their families and everybody that helped them along the way, but secondly, from an experience standpoint, this is like nothing else. You can’t help but become a better player by participating in one of these because between playing with the people that you’re playing with and playing in the atmosphere you’re playing in, you get better." The number of Olympians demonstrates the depth and strength of the Blues’ roster. It helps to explain how the Blues have the best record in franchise history (29-7-5, 63 points) at the halfway point of the season. Steen, who is working to return from a concussion, leads the Blues in goals (24) and points (38). Oshie has a team-high 29 assists and is second in scoring with 37 points. Backes (32 points) is third on the team in scoring, Shattenkirk (31) and Pietrangelo (28) fifth and sixth. Bouwmeester (24 assists, 27 points) is plus-21 on the season, which is tied for third in the NHL among defensemen. 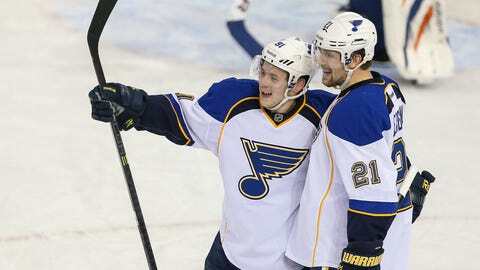 At 22, Tarasenko (13 goals, 24 points) is the youngest Blues player selected. Halak, who has been battling an illness but is expected to return soon, is 17-6-3 this season with a 2.40 goals-against average and .907 save percentage. He is 132-78 in his career with a 2.41 GAA and .916 save percentage. "I think as many as we’ve got going, the better," Hitchcock said. "I know it’s going to be a hard go for maybe a week or 10 days when we get back, but I think the experience that these guys go and the intensity they are going to have to play at is going to do nothing but help their careers." Backes, Halak and Bouwmeester will all be participating in the Olympics for the second time. Backes was on the U.S. team that won silver in 2010. Halak played in 2010 for Team Slovakia, which lost to Canada in the semifinals and then lost to Finland in the bronze medal game. Bouwmeester previously played for Canada in the 2006 Winter Olympics when the Canadians lost to Russia in the quarterfinals. Hitchcock and Blues general manager Doug Armstrong are also part of Team Canada. Hitchcock will serve as an assistant coach, and Armstrong is the associate director of player personnel.